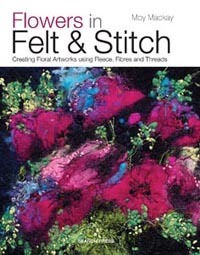 Packed with colour and style, this gorgeous and inspiring new book from Scottish artist Moy Mackay delves deep into the world of felt painting. The book includes an introduction to Moy's use of colour and texture, as well as a useful section detailing what inspires her and how she forms these initial ideas into a composition. There are 4 easy-to-follow but inspiring step-by-step projects, along with extensive galleries of Moy's vibrant work. Unlike the broad range of her previous book, the focus here is flowers - in still life, in the landscape and as botanical portraits - and the book includes an in-depth techniques section on creating a range of different flower and leaf shapes, so that the reader can go on to produce their own unique masterpieces.